Many couples come into therapy for relationship issues after the “in love ” and “idealized fantasy ” stage of their relationship has worn off. They may be in continuing power struggles over whose needs are going to be met, or in an alienated state where they live parallel lives, or just feel indifferent. This short article is an attempt to explain why this often happens. It will be limited due to size constraints and simplification of the information. I will use the male/female pronoun, and marital relationship for simplicity. The Idealized or “in love ” stage: You are what I need you to be. In this stage, one often has longings about her being what I need her to be. These are often projections of the missed needs for Love/attachment/connection that were missing, or inadequately provided, in childhood from caretakers. In essence, in this stage, I love you for what I need from you, or what I need you to be. The fantasy is that finally I have found someone who provides the needed experiences missing from childhood. This can be an intense stage of Idealization, with distortions of perceptions about the other person’s less positive traits being ignored. The longing and dread stage: You are not meeting my needs. In this stage, the person starts to realize that the needed experiences are now being accompanied by unwanted repeated experiences. These triggers remind us of the ruptures of childhood experience. This leads to a conflicted state of both longing and dread. This can be a very painful time for couples due to intense retriggering of early painful experiences, power struggles, distancing, etc. This can lead to intense disillusionment when one realizes that not only is the spouse not giving them the needed experiences, but also is triggering painful reactivations of earlier feelings of failures to connect, pain, hurt etc. Some marriages seem to fall apart at this point as these triggering experiences lead to anger, hurt, power struggles and alienation. Healthy disillusionment stage: You are not what I need you to be. If the relationship can survive the longing and dread stage, the couple may move into healthy disillusionment. I call this healthy because it brings one back to the reality that the other person is not magically going to meet my needs, or always respond the way I want. We realize that adult needs must be negotiated, with compromise, between differing needs. We realize that the other is just who they are and always have been. This can lead to a time of realizing what was missed in childhood attachments and can be a very productive time in therapy. We can use the experience to get back in touch with losses, pain, hurt, sadness etc. and unresolved grief. It is important to point out that this does not apply to marital problems that involve domestic violence, addiction, etc. These are crisis issues and need to be dealt with legally or with professional assistance. Mature love: I do not need you to be something for me. “Genuine love is volitional rather than emotional. The person who truly loves does so because of a decision to love. This person has made a commitment to be loving whether or not the loving feeling is present.” – M. Scott Peck, The Road Less Traveled: A New Psychology of Love, Traditional Values, and Spiritual Growth. “The problem of unmet expectations in marriage is primarily a problem of stereotyping. Each human being on this planet is a unique person. Since marriage is inevitably a relationship between two unique people, no one marriage is going to be exactly like any other. Yet we tend to wed with explicit visions of what a “good ” marriage ought to be like. Then we suffer enormously from trying to force the relationship to fit the stereotype and from the neurotic guilt and anger we experience when we fail to pull it off. ” – M. Scott Peck, In Search Of Stones. During the stage of movement from immature love, a more mature love can develop. It moves toward I love you for who you are, not for what I need you to be. This can take many years, but is worth the effort to finally find intimacy and companionship that is more unconditionally loving. As Scott Peck has said, we are now able to freely sacrifice and stretch ourselves for the emotional and spiritual well-being of the other, without trying to get something in return. Mature Love is a sacrifice and stretching of ourselves; a love that becomes more of our choice and commitment freely given. Jeffrey M. Lance is a Licensed Psychologist in Private Practice in Glendale CA. 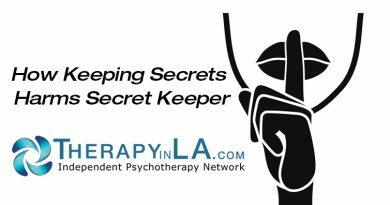 He is a member of the Independent Psychotherapy Network and can be reached at his office: (818) -265-4052. Copyright 2017 by Jeffrey M. Lance, Ph.D.